Don't forget tomorrow is our first casual for a cause! Mad Science of Greater Salt Lake is returning to Saint Olaf Catholic School with their program NASA: Academy of Future Space Explorers. Registration ends September 27, 2018 please see the attached flyer for registration details. Families, students, staff, and friends turned out for the annual ice cream social last Wednesday night! Important information from the parish for our 2nd and 8th-grade parents preparing to receive sacraments this year. Did you know specials (Art, Library, Technology, PE, and Music) have class pages? You can see photos, projects, assignments and more! 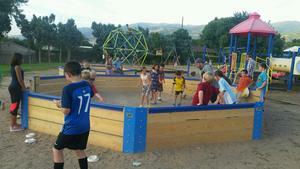 What are the big wooden structures on the playground? What is this Ga-Ga Ball I've heard so much about? On Wednesday, August 22nd we welcomed our families back to school. Having the building filled with our families was beautiful. 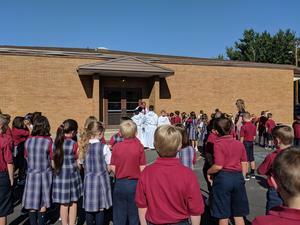 Our school community continues to make a joyful noise as Father Rene offered the school and all who dwell in it a blessing of a meaningful, joyful, and faith-filled school year.